From Ontology’s launch in New York City in November 2017, the unveiling of the project has proceeded at a fast pace, and with it has come an overwhelmingly positive and confident reception from the world. 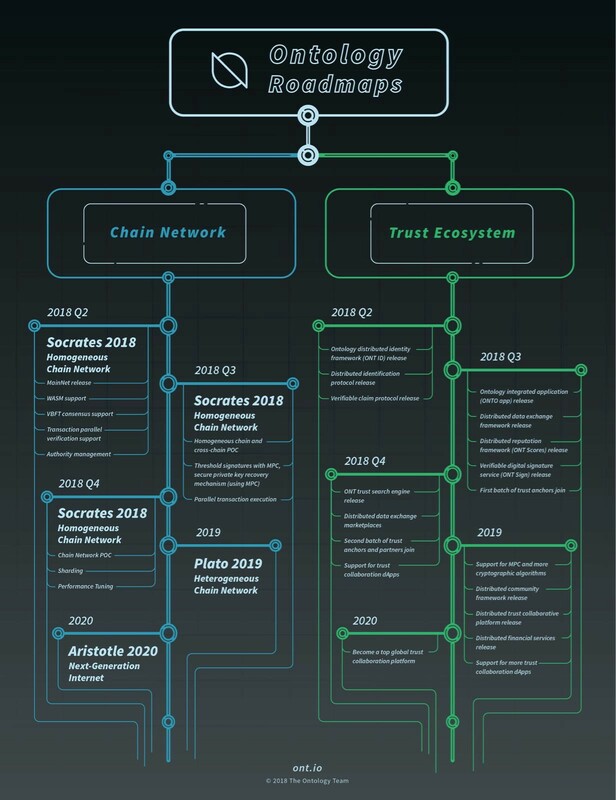 We have been finalizing the roadmaps and we would now like to share with you the direction we are taking to cultivate the high-performance public multi-chain network and distributed trust collaboration platform in the coming months and years. Bear in mind this is the first version of our roadmaps. We will continue to update it and share with the community. This will focus on the functionality and performance development of Ontology’s basic chain. This includes consensus algorithms, transaction parallel verification, smart contract platforms, and network communication platforms. Essentially the research and development for the foundation of the platform in the follow-up. For governance, research on the dual token governance model will be carried out and experiments completed. The Ontology Distributed Identity Framework (ONT ID) includes the Ontology distributed identification protocol and verifiable claim protocol. It is implemented fully on the Ontology blockchain through smart contracts. ONT ID will support collaborative services such as distributed and diversified ownership confirmation, identification, and authentication of various entities including individuals, legal entities, objects, and content. ONTO is an integrated user terminal based on the Ontology blockchain, which is an entrance for the trust search engine and blockchain system. ONTO will integrate functions such as digital identity management, digital asset management, distributed data exchange, and so on. Based on the distributed data protocol (ONT Data), the distributed data exchange framework (DDXF) will allow for customizable data trading marketplaces with ensured data and financial security. With DDXF, developers in the Ontology ecosystem can easily develop decentralized data applications that meet the needs of various scenarios. ONT Scores provides support for various businesses to develop different credit evaluation logic according to distributed credible data. ONT Sign is an online electronic signature service based on blockchain authentication, which can be used for online certification, forensic services, online arbitration, litigation proxy, and other derivative services and functions. Trust anchors are partners that provide authentication services in the Ontology ecosystem. They may consist of government agencies, universities, banks, third-party authentication service agencies (such as CA), biometric companies, and so on. ONT TSE provides portal, authentication, and connecting services for individuals, assets, objects, and affairs. We will support more data exchanges based on the distributed data exchange framework (ONT DDXF) and connect multiple data exchanges through data transaction protocols to support more efficient data distribution. In Q4, we will welcome the second batch of trust anchors and partners to enter the Ontology ecosystem. These partners will further strengthen the infrastructure of the Ontology trust ecosystem. We will also support the development of various dApps by external developers. This will focus on Ontology’s chain network ecosystem: making different blockchain architectures compatible with the ecosystem to achieve cross-chain business interoperability. This will focus on the research and development of sharding technology for Ontology. Sharding technology is the most important part of the chain network plan. For sharding it is necessary to complete research and development of new smart contract platforms, network platforms, and consensus algorithms for the basic chain. For governance, research on multi-token models will be carried out and experiments completed with a few core partners, as part of the larger sharding research. This will focus on business interaction solutions with mainstream blockchain networks. This includes, but is not limited to, interaction and implementation of authorization management models, cross-chain business discovery, cross-chain asset anchoring, and cross-chain asset-based business exchange. For governance, there will be research on multi-token models, as well as different value anchoring and exchange models for different blockchain architectures. We will support MPC and more cryptographic algorithms to meet data transaction, collaboration, and governance needs. We will also launch the distributed community framework to support decentralized communities and community applications, as well as launch distributed financial services to support financial service applications. There will also be more trust collaboration products and solutions to support decentralized applications in more industries and across more regions. We will continue to complete the implementation of Ontology sharding technology to accomplish large-scale commercial deployment of the chain network. For governance, there will be research into decentralized governance for large-scale networks. We will continue to implement Ontology ecosystem technology. An Ontology-based cross-chain solution will create an Ontology heterogenous chain network, which will be able to accomplish large-scale commercial deployment of the Ontology chain network. For governance, there will be research into decentralized governance for large-scale heterogeneous blockchain networks. Ontology will establish itself as a top global trust collaboration platform. This will focus on building an information trust system based on the Ontology trust network ecosystem. This means in-depth integration of Ontology’s trust mechanisms into existing internet information organization. We will expand the blockchain ecosystem, from hard assets to light assets, to bring trust to the whole of the internet. Our roadmaps do not end in 2020. Ontology is a project whose philosophy has no limits in our digital world. Nor is the project constrained to these roadmaps. The Ontology team is focused on building the underlying infrastructure in which partners of all shapes and sizes can operate and collaborate on top of. Up until 2020 and beyond we will work with partners across industries, from individuals to large corporations, to together build, maintain, and cultivate the trust ecosystem. Are you a member of our ecosystem? If you are a developer, make sure you have joined us on our GitHub and Discord. If you think you could be an institutional partner for Ontology, please introduction yourself on our website here. You should also become part of the general community. Our full list of channels where you can keep up to date with us and interact with the community can be found at the end of this letter. With you we will build the new trust-based digital generation!